Sigh. First day of school for second-grader Wyatt. He tried to act all composed this morning, emerging from his room with his school clothes on and his pencil box all organized. But I know better. He's thinking, "Will Kyle still be in my class? Will Oscar and I get to have recess together? Will people remember and still like me?" He is one lucky, loved-up kid, but days like today are still heartbreaking for his mother. His bus route got all mixed up, they called me from school,and he finally got off at his bus stop an hour late, lower lip trembling. Remember that feeling, like you might get left behind? I stayed up last night to make these little loaves for his teachers. I know they don't expect it, but it helps me get back in the rhythm of things, gives me some small way to acknowledge how hard they work every day. And they do. Damn. They've got all the cubby holes set up with the little name stickers, ordered special books for Wyatt to keep up with him (Bursting with pride? Yes. ), and they'll get up tomorrow and pay that much attention all over again. I really, really like this bread and can foresee making it many more times. 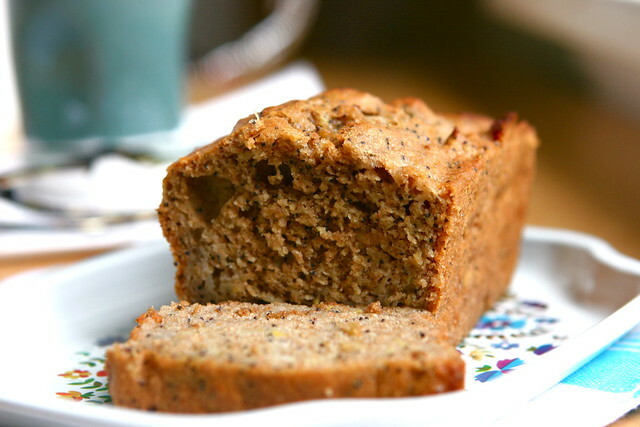 Whole wheat floor, grated pears, lemon zest, poppy seeds--tastes like bright, crisp autumn with fiber to boot. I made three mini-loaves so as to spread the wealth, but you could certainly make one big one and keep it all to yourself. I'm certain there are changes going on in your life, too. Whatever they are, breakfast is always there to keep us tethered. And maybe it will be as delicious as this. Adapted from Oprah magazine, of all places. Like I've said many times, you don't have to look far these days for interesting or inspiring recipes. Have I mentioned my magazine affliction? I only have five subscriptions at the moment, but if I had my way, there would be more. Oprah magazine is my guilty pleasure. I love reading about what kind of mascara I should buy even though I don't wear it. Preheat oven to 350°. Brush one 9" x 4" loaf pan or 3 baby loaf pans with oil or butter. In a medium bowl, whisk together flour, baking soda, baking powder, and salt. In a small bowl, stir together oil, lemon zest, eggs, honey, applesauce, and poppy seeds. Add to dry ingredients and mix until combined. Fold in grated pears. Pour batter into prepared pan. Bake until bread is golden brown, slightly cracked on the surface, and a toothpick inserted in the center comes out clean, 75 to 85 minutes. (if you're baking mini-loaves, it will be more like 40 minutes). Remove from oven; let stand until completely cool, about 30 minutes, before serving.